Fr. Dimitrios was born in the village of Platanos in the prefecture of Trikala, Greece, on August 1, 1902. His parents Chrerstos and Catherine Gagastathis were pious men. On April 10, 1921, he was drafted into the army in Asia Minor. He also served in several places in Macedonia. On June 18, 1924, he was discharged from the army. In February 1928, he married Elisabeth Koutsimpiris from Platanos. The same year he was ordained reader by the Bishop of Trikki Polycarp. On Mary 24, 1931, he was ordained deacon, and on the 26th of the same month he was ordained priest by the same bishop. From his marriage he had nine daughters. Five of the six that live today are married, while the youngest one became a nun, consecrated to the worship of God. For forty-two whole consecutive years, he served as the parish priest of his village. On October 1, 1973, he resigned for reasons of health. 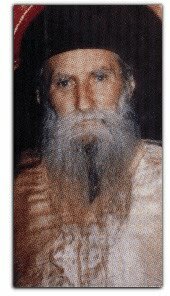 Since then, he remained confined at home, living as a saint with incessant prayer, glorifying and thanking God for the trial of his illness. He delivered his holy soul to the hands of the living God on January 29, 1975, in peace. Throughout his life, he was pious, just, simple, humble, merciful, industrious, full of faith and love for God and for his neighbor, praying incessantly for the sake of the whole world. He tended his rational sheep as a good shepherd and became a teacher to everyone, instructing by his words, his letters and, above all, by his holy life. The ever memorable Fr. Dimitrios worked for the Holy Church of Christ with all his strength. We believe that the Good God, Whom he unselfishly loved and self-denyingly served, and Whose infinite mercy he constantly begged for, has already taken him in the joyous dwellings of Paradise, to rejoice eternally in the blessedness of His Kingdom, through the prayers of the Most Holy Theotokos, the Queen of all the Holy Archangels, his protectors, and of all the Saints. I'm definitely not educated, but I can empirically tell you - that's what life has taught me - that it's at night and on en empty stomach that one can pray better. We haven't placed Christ inside us and that's why we don't know what's love, peace, concord, etc. Since I can't preach, let me at least weep for my sins and for those who have gone astray. Prayer is a telephone, a wireless, by which one communicates directly with God. You dial the number on the telephone of prayer to speak with God and He answers. You hear Him clearly, you feel Him very close. Prayer comes first in the larynx, then goes up to the brain and then down to the heart. And then well, theaters come to the eyes. From that point on there's nothing more to be said. It's true that in the beginning, you'll have difficulties. You'll try to pray and at time so you won't be able to, at times you'll have wandering thoughts and temptations, and at other times you won't be able to wake up at night. But you must insist. The Lord, seeing your disposition, will uphold you and deliver you from all temptations. We must not waste the whole night sleeping, because then Satan does whatever he wants with us. Nightly prayer is of great value. The people sleep and God listens. No matter where I go, I stick to my program, which was been called "According to the order of Melchisedek" and has been countersigned by many spiritual Fathers. I have seen many things in my life, one of them being that prayers, supplications and Divine Liturgies have caused many to return to the Church's fold. I entreat God and His Saints to enlighten all those astray so that may believe and come back to the bosom of the Church, which always keeps her arms open and waits for them. This is all I know to say and keep bothering God, the Most Holy Theotokos, the Archangels and all the Saints. If they don't like this, may they forgive me, as I'm unlearned and don't know what I should be asking for. We must not with too much boldness to God and to the Most Holy Theotokos. We are all sinners and God doesn't hear a sinner's voice. Despite that I'm a sinner, I kept asking persistently based on "Ask, and it shall be given you, and you shall find; knock, and it shall be opened unto you" (Matt. 7:7). This is what I understood in my life: What is impossible with men, is possible with God (Luke 18:27). Fasting is a great thing. Adam was expelled for not keeping it. We must love fasting, because through it the passions go away, the heart and body are purified, and once we are made thus free, we can pray better. Our fasting must be accompanied with a lot of obedience and humility. We must do whatever God wants. We must have a lot of humility. We are nothing in the sea of God's love and goodness. What does God say? "Upon whom shall I look, except upon the meek and the humble and the one who fears my words?" The great vitures are three: humility, obedience, and love. When there is no love and obedience to the local bishop, everything is ruined. We cannot have boldness before God when we are not obedient, humble. Our heart must be simple in order to receive the word of God. No selfishness or hard-heartedness. Simplicity of heart makes us similar to God and to the saints. Everything is simple. The simple man is neither wicked nor can he think something wicked. He is resettles. He is like a child. His prayer is readily received. He prays for the others and for his sins. How can you not weep when you see how much you've grieved God, the Angels and the Saints, who wait for you in Heaven and benefit you while on earth? Love cannot be limited to one person alone nor can the fruits of one's work be confined in a single environment. The lamp that is put on the table enlightens the whole house and everyone in it Matt. 5:15). I can't find rest. I want to help everyone who asks me for help, even the whole world. When you love God and all men with your heart, then you are in God's law. We shall be judged because we don't love. I don't pray for myself. I love men so much that I pray only for the others. How can you not pray for the afflicted, the sick, the poor? Never be afraid for a man who loves. In him God dwells. You ask me to make a Liturgy for you so that God may enlighten you to do well in the exam. I'm serving Forty Liturgies for you and you ask for one? Have love among you, humility and obedience. God and the Angels rejoice in these... Love all the Most Holy Theotokos, Her who so much helps out human and sinful race. The purpose of whatever prayers and services we do is to come closer to God and get to love Him more. Satan doesn't know our thoughts. He knows only whatever he himself puts in our minds, as well as whatever he figures out from our movements, and whatever he hears from our words... Satan opposes every Christian who strives sincerely. However, no one must be afraid of the demons. They are smoke, dust and stench. They don't have power over men. God allows the temptations to try men's faith. They can be found even in the church, even during the time of Divine Liturgy. The put bad thoughts in the minds of the people and distract them from prayer and attention to the divine mystery. However, at the time of the Cherubic Hymn and of the Great Entrance, they depart. Only Lucifer, their leader, can enter in the sanctuary. No one else. I was once serving liturgy at night, when they came into the church and started overturning the chairs. The archdemon came into the sanctuary, shut the window and grabbed me by the throat to strangle me. I asked help from the Archangels, and when they roosters crowed in the morning, they all went away. "This generation goes away only through prayer and fasting" (Mark 9:29). Satan must not find any cowards, because he does whatever he wants with them. Satan is afraid of the pure and sincere confession, of humility and love. Where these exist, he just cannot enter. How do the old-calendarists say that our Sacraments are invalid? In 1947, while I was doing the service of Sanctification and chanting "Great art Thou, O Lord, and Great art Thy works," a smoke came out of the cup and the water was heated up. Even in the cups that pious Christians held, the water was heated up. How then can you tell me that the Sacraments are invalid? How can God work miracles with the new calendar, if it is not right? How did the miracle of Saint Bessarion happen in the village of Dousiko? This is enough to show to us that the right faith, love and the keeping of the commandments play an important role in the sanctification of man. I take account of nothing else. I wrote about this matter to Fr. Philotheos Zervakos (St. Nectarios' disciple) and he responded to me rightly - and so also I believe, the unlearned one, from my life's experience - that thirteen days can neither take you out from or put you into the Kingdom of Heaven... I also asked the Archangels about it and they told me "Stay where you are." We find it impossible in this day and age to work well in this life according to God's will, because we lack the two wings of love and humility. God saved us from communism, but Satan delivered us to materialism. Now it's time to weep and pray for the condition of today's world. We must pray that God may enlighten them to see the way of God, the way of truth and of righteousness. Both clergy and people today have lost their spirituality. They constantly talk only about material and political things. Through her weeping icon, the Theotokos shows that she's sad, because she sees what Russia suffers by the atheists, and because she's blasphemed by many. Our Faith is alive, but we abandoned it because selfishness and materialism drew us away. Indeed our Faith is alive, but we don't want to follow it, because it's a bit heavy and requires some commitments from our part. People want freedom and a depending slope so that they don't get tired and sweat, buy they don't know that this descent leads to a bad end. The way of perdition looks initially good, happy and easy. It offers artificial delights and pleasures, but all this vanishes quickly. We must pray incessantly on their behalf. Perhaps some soul might be save. In particular, we - the priests - have a tremendous responsibility before God and men. The good chanter and the priest play a great role in good church services. In my wallet I carry Christ's icon. He takes care of every human need. I always have the wallet open, and it's always full. Whatever one may give, God gives back double. ONe one hand man gives away, and on the other hand God brings in. We must be glad in our trials and take special care lest we become indignant at the last minute and be punished in hell. Our life is a meal. Whether the meal is prepared well or not depends on us. But even if the meal is prepared well, we may not partake of it, should we kick over the table at the last minute. "Taste and see" (Ps. 34:8) that Christ is the Lord of eternal life. Monasticism is Christ's army and Satan's enemy. The monasteries are the outposts of the Church. Without outposts, the enemy will capture us. Prayer in monasteries reaches God like a bullet. As a foreign army fears the aircraft and hides, so also Satan fear the prayer of the monastics and goes away. We've been encircled by Free-Masonry and many fight our Church, but I believe that they try in vain, as the chief of the Church is Christ Himself, and she's not going to perish. We must all pray, both old and young, that God and the Most Holy Theotokos enlighten the high-ranking men of the Church so that they may love one another and work for the Church which is being under attack by the foreign heresies. I think I've grieved then a little, but truth is bitter and must needs be revealed for the benefit and salvation of their souls. I never worried anxiously about anything. I cared for my children without weariness and anxiety. God Who gave them to me took also care of everything. The one who runs to magicians and fortune-tellers is called a rascal and loses protection even from God. I don't remember anything from this life; only heavy load of my sins. If you learn that I left this world, don't get sad, but rather be happy because the Church will have gotten rid of the most sinful and unlearned priest of the era. Jesus, the good Shepherd, I thank You, because you gave even to me, the small and weak one, the same command that You gave to Your apostles, when You told him: Feed my lambs, feed my sheep" (John 21:17). Never would I dare, O Lord, to accept such a heavy mission, if I didn't believe that Your grace remedies what is weak and makes up for what is lacking. Therefore, in this moment, in which I feel my shortcomings so intensely, I, your priest, Your sacrificer, the small shepherd of Your flock, implore You. Uphold me, O Lord, keep my heart pure, whole, free from money and attached to Your commandments. Take away from Your servants selfishness, ostentation and worldliness. Keep him from anger, rancor, envy and jealously. Make me a man of prayer, so that not only with my lips, but also with my heart I may praise and glorify Your Holy Name. Help me not forget the holy feelings of my first liturgy, and by them to chase away the germ of habit, which every so often comes into me. Help Your priest, O Lord, be always an angel of comfort for the afflicted, a source of spiritual invigoration for the disheartened, a guide towards Your peace, and a source of joy for the wounded. Help me, my Savior, combine in my life and work tenderness with firmness, tact with strength, sensitivity with strictness. Reduce my faults, so that no one may fall because of my weakness. Teach me, Lord, how to instruct the children, inspire the youth, advise the adults, turn back the sinners, encourage those who are about to die. Teach me, O Lord who know the hearts of men, how to perform the Mysteries of Your Church and especially the Mystery of Holy Confession. During that time, make me be a perfect psychologist and an affectionate father. Help me in my parish an inspiration of good works and a leader in God pleasing endeavors, so that all may be won over for their own happiness and for the glory of Your Name. Amen. O God our Savior, the hope of all the ends of the earth and of those far off in the sea, the Good Shepherd, Who gave Your soul as ransom for Your rational sheep, Who do not desire the death of a sinner, but that he may turn back and live, the Forbearing, the All merciful, the All compassionate, Who gave us repentance for the remission of sins, Who are full of mercy and love for mankind, forgive all our sins that we have committed since our childhood, in words, in ignorance, in mind, voluntarily and involuntarily; forgive also all sinners and blasphemers and give to us, to those, and to all men, true repentance, pure and sincere one, to enlighten, guide instruct, uphold, strengthen and confirm us on the unshakable rock of the Faith, the rock of Your divine commandments, so that having put off the old man of sin and put on the new man in Christ, we may live the remaining time of our life in chastity, holiness, justice, piety and in God pleasing manner and be made worthy of Your Heavenly Kingdom; may that we all attain this through the prayers of YOur most pure Mother and of all Your saints. Amen.